When thoughts consist of the same topic and are opposing points of view, they create opposite rays and form a straight line representing all thoughts in each direction on that subject. 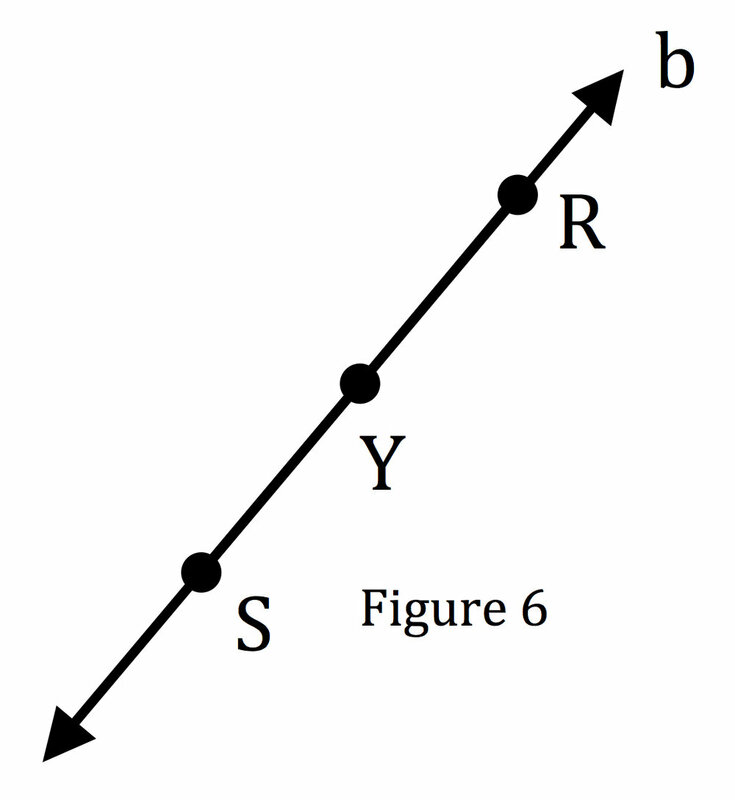 The lines in Figure 4 represent an specific topic and have a theme to them. Still with me? If so, let's dive into an example. One set of opposing thoughts that is always stirring within me is the existence or non-existence of God. 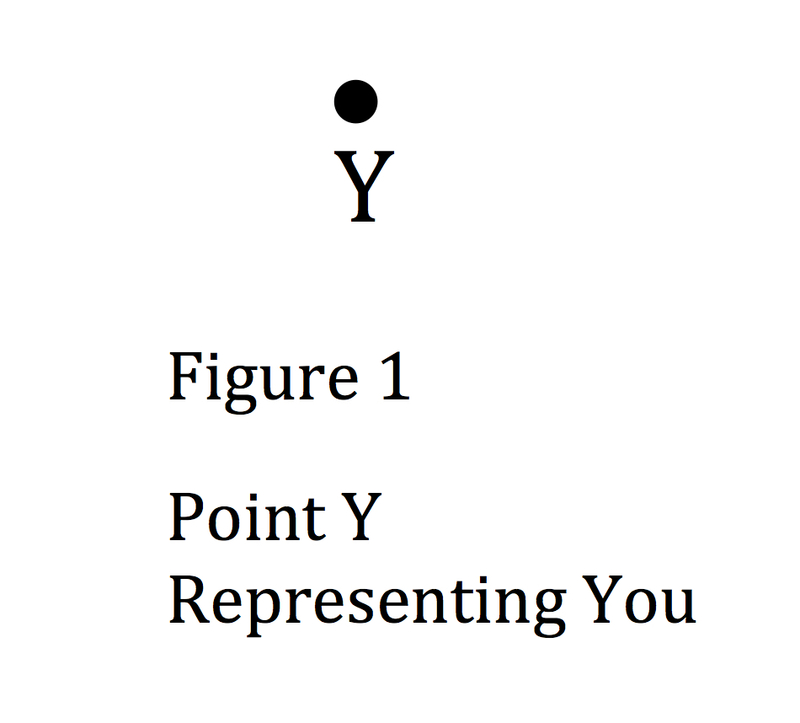 Let's represent this by line g in Figure 5. Ray YG represents thoughts in the direction of the existence of God, and Ray YN represents thoughts in the direction of no existence of God. Another set of opposing thoughts is based around belief and whether a belief is based on a particular religion, dogma, or mystery of life or if the belief is based on scientific evidence gathered in the physical world and witnessed by others. 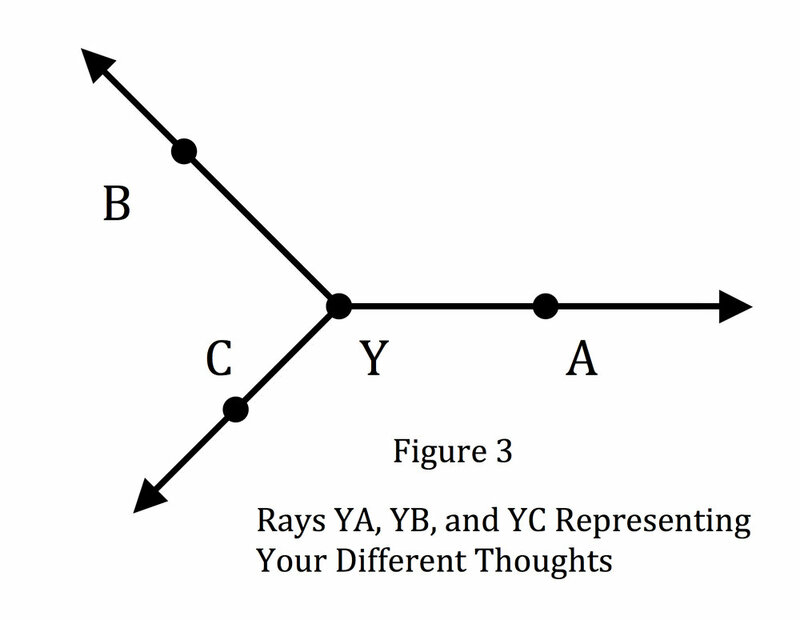 Let's call this Line b as in Figure 6 with opposing rays YR and YS. Ray YR represents beliefs based on religious ideologies and/or mysterious explanations of the world, and Ray YS represents beliefs based solely on physical evidence that can be found in the world and the universe. Both of these rays are searching for truth and explanations of worldly phenomena, yet have different directions in which they travel. One is more internal and subjective and the other is more external and objective. 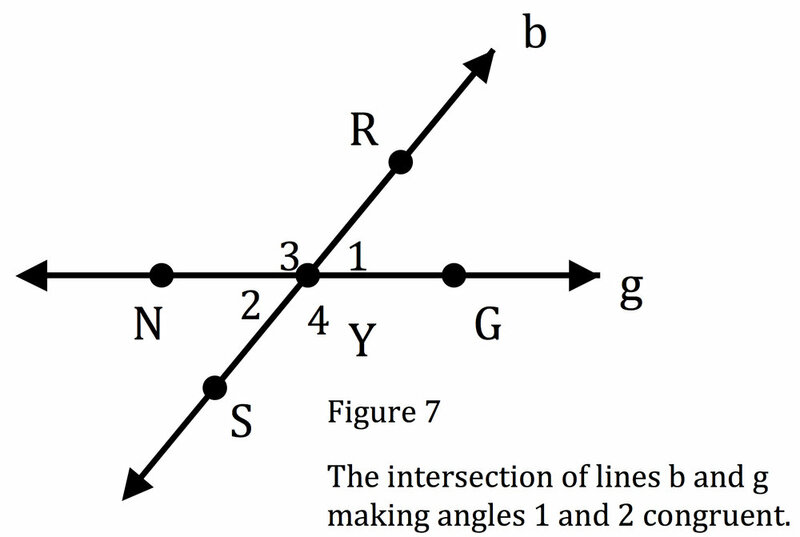 When we see the intersection of lines b and g in Figure 7, notice the angles that are formed. We can think of these angles as the combination of thoughts among the rays that form them. For example, angle 1 would represent all thoughts that combine religious or mysterious beliefs on the existence of God, and angle 2 would represent any scientific or evidence-based beliefs on the existence of God. Angle 3 would represent religious/mysterious beliefs supporting No existence of God, and angle 4 would represent the scientific and evidence-based beliefs that No God exists. Angles 1 and 2 are called Vertical Angles, and so are angles 3 and 4. You can think of these as opposite angles although Vertical angles is the correct vocabulary. These Vertical Angles start showing us more opposing points of view similar to how the opposite rays were showing us opposing thoughts. The thoughts represented in angle 1 (Religious explanations of God) are typically opposite the thoughts in angle 2 (Scientific evidence of No God) in the same way that the thoughts in angle 3 (Religious explanations of No God) are opposite the thoughts in angle 4 (Scientific evidence of God). Basic geometry tells us that Vertical Angles are Congruent. Congruent, for those of you that don't remember, means similar and equal. Applying that principle to our opposing points of view tells us that the Vertical Angles (or opposing arguments) are similar and equal. Since Vertical Angles are Congruent, that means that angle 1 = angle 2. The religious/mysterious explanation of the existence of God is equal to the scientific reasoning that there is No God. They will always exist and oppose one another, yet are equal and valid. Neither is bigger or better than the other. They are equal. When the size of one increases, the size of the other increases just the same. The same is true for the religious/mysterious explanation that there is No God (angle 3) and the scientific evidence that God exists (angle 4). They oppose one another yet are equal and valid. Now when the size (or strength) of one pair of vertical angles increases, the size of the other pair decreases. When the arguments 1 and 2 increase, the arguments 3 and 4 decrease. This creates a lot of tension, upset, and suffering and plays into the "I'm Right" mentality that we currently reside in. The 1 might think that they are "Right" especially when the size of their angle is obtuse (larger than 90 degrees) and taking up most of the space along a line. They oppose the view that is their opposite (2) even though it is equal, and easily think that their argument is better than the other two (3 and 4) because the measurement is bigger. The only situation when Harmony and Equality can exist in this picture is when both lines are perpendicular, that is, when all angles are Right. The only way one argument can be "Right" is to recognize that the opposing argument is also "Right" for they are Vertical and therefore Congruent. For Harmony and Equality to exist in one's Self surrounding these thoughts, s/he must recognize that all arguments involving Religion, Science, God, or No God are equal and valid. Not one single argument is any bigger, stronger, better, or more valid. All views are equal, valid, opposing but not in opposition, and more importantly "Right". The opposing forces at work assist each argument to strive to improve itself, yet doesn't make it better than any other. If we want a more Harmonious world, then it may be time to change the driving force in our arguments with others from the self-centered, ego-based "I'm Right" to the more inclusive and loving "You're Right". By acknowledging that your "opponent" is "Right" you allow all arguments, including your own, to be "Right", and everything balances out according to the basic geometric principle that All Vertical Angles are Congruent.